Bluffton has been in the news a lot lately — and rightly so! While the entire Lowcountry is loaded with charm, few areas are as quintessentially southern as Bluffton. As South Carolina's fastest growing town, Bluffton is booming with new construction, restaurants, and businesses. 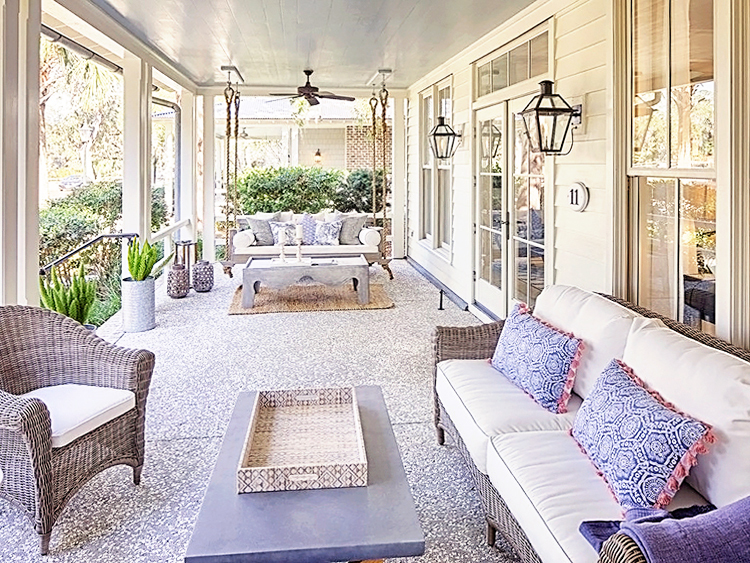 It's also a real estate hotspot, so it's no surprise HGTV picked Palmetto Bluff as the location for their 2018 Smart Home! 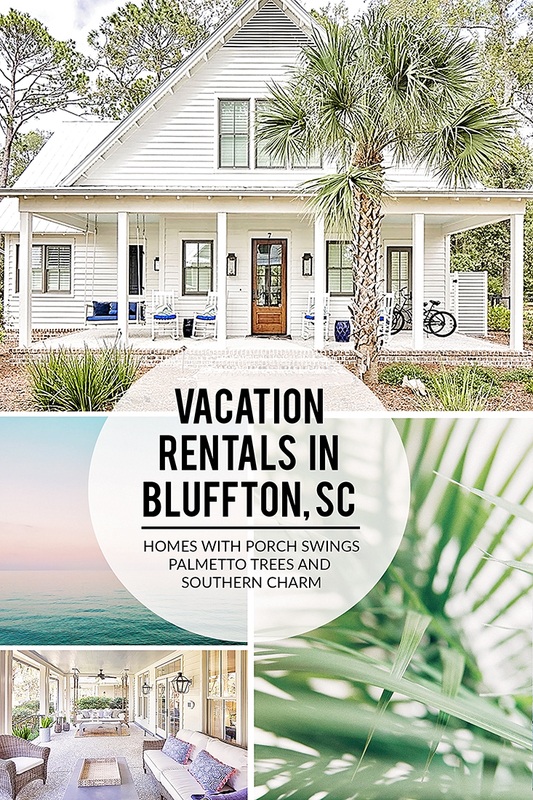 Today I'm sharing my favorite vacation rentals in Bluffton, so you can come for a visit and see what all the fuss is about. Bluffton is located halfway between Hilton Head and Savannah and is the perfect spot for a relaxing getaway. Keep reading to learn more about each area and discover my favorite vacation home rentals in each unique location. If you're new to vacation home rentals, you're welcome to use this $40 credit on your first rental through Airbnb as a gift from me! Old Town is the original center of Bluffton and is located on a beautiful bluff alongside the May River. This is the slower and more relaxed part of town — unless your visit happens to coincide with one of the town's major events, such as Taste of Bluffton. Old Town is where you'll find The Church of the Cross, The Bluffton Oyster Co., and the weekly Farmers' Market. Here's a Google map I created to show exactly where Old Town Bluffton is located. Stay in this area if you like charming neighborhood walks down to the riverbank, front porch sittin', chatting with the neighbors, or perusing local art in galleries and cafes. The shops in this area close down around 5, so it's pretty quiet at night. Perks of this Vacation Rental: How adorable is this tiny cottage?! It's the perfect mother/daughter getaway spot. (It's even owned by a mother/daughter duo!) You can walk to the shops in The Promenade, The Church of the Cross, and all the Old Town hotspots from this location — no car necessary. The porch is the perfect spot to relax and enjoy a glass of wine after a long day of shopping. Drawbacks of this Rental: There's only one bed, but the couch converts to a sleeper. For that reason, this rental is best suited for solo travelers, a couple, or a mother/daughter getaway. Perks of this Vacation Rental: This carriage house has a very reasonable nightly rate for the area, and it includes Military, Law Enforcement, and First Responder discounts. 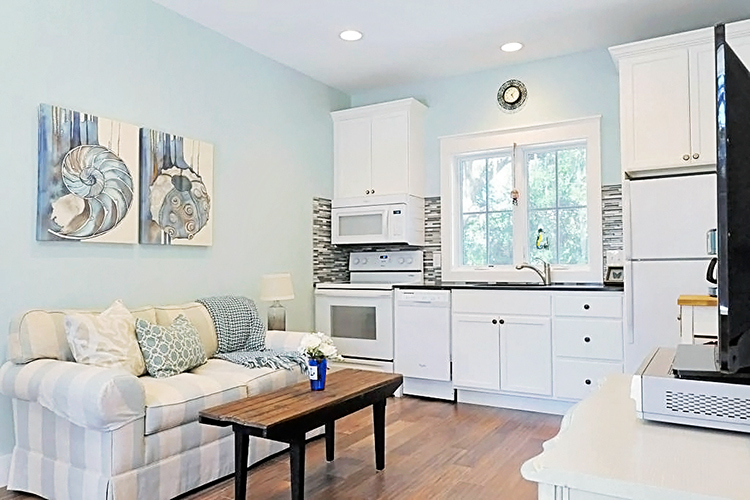 It's beautifully decorated in calming coastal blue tones and has the look and feel of a cozy beach cottage. You absolutely have to check out the amazing outdoor bed tree swing! Drawbacks of this Rental: I'm having a hard time coming up with any drawbacks to this rental! It's perfect for couples, so I guess the only drawback is that families with children couldn't stay here due to size constraints. The 175+ 5-Star reviews on Airbnb confirm that it's a pretty sweet little rental. 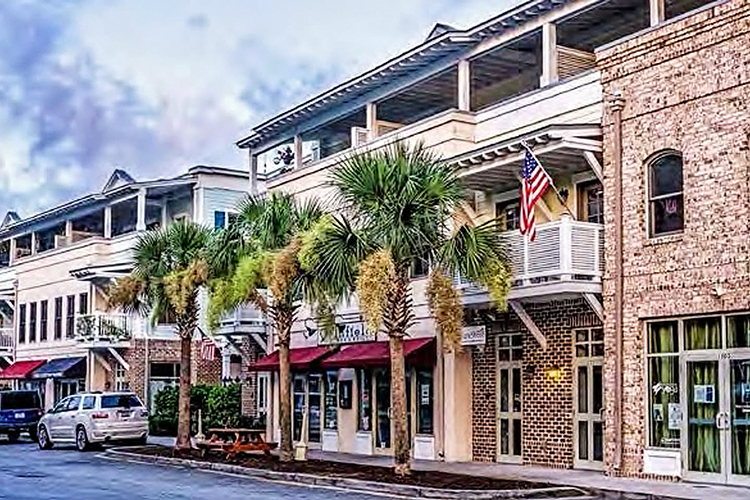 The Promenade area of Bluffton is within walking distance to Old Town Bluffton, and many of the buildings here feature newly established local businesses. Consider this the up-and-coming, trendier part of town. You'll find a slew of incredible restaurants and shops at The Promenade, as well as local real estate offices, design firms, and medical/dental offices. Here's a Google map I created to show you exactly where The Promenade is located in Bluffton. Stay in this area if you're a foodie and prefer to be steps away from the majority of Bluffton's best bars and restaurants. Perks of this Vacation Rental: There are plenty of bedrooms and bathrooms in this rental to ensure everyone has their own space during a girls' trip without feeling too cramped. It's right in the heart of The Promenade, so it's mere steps away from incredible shopping, dining, and bars. You'll even be able to hear music from the patio if there are any bands playing in the area! Drawbacks of this Rental: There's a yoga studio next door, so you may be able to hear occasional activity from there. The kitchen/dining area is fairly small, but that's probably a non-issue since you'll likely eat most meals out anyway! The idyllic neighborhood of Palmetto Bluff gets my vote as the perfect home base for a family vacation in Bluffton. The gated neighborhood is lined with centuries-old live oaks, the streets are lit with flickering gas-lamps, and the luxurious farmhouse-style cottages appear pulled straight from the pages of Southern Living magazine. (Think high-end Fixer Upper-style homes!) The community is safe and there are numerous activities suitable for families within walking distance or a short drive. Here's a Google map I created to show you exactly where Palmetto Bluff is located. You may have to zoom out to see Bluffton, which is just north across the May River. Stay in Palmetto Bluff if you're seeking an upscale community with lots of amenities and activities suitable for all ages, such as kayaking, golf, tennis, swimming, and relaxing spa visits. Perks of this Vacation Rental: This house was clearly designed for families who enjoy spending time outdoors in the beautiful Lowcountry! It includes a screened porch dining area and a fire pit surrounded by Adirondack chairs. A golf cart is included at no additional fee so you can easily head out to the pool, tennis courts, or RT's Market. Two bikes are also included with the rental price. Drawbacks of this Vacation Rental: You'll need to pay an additional $65/day fee to access the spa, tennis courts, and a few other facilities. This rental is NOT within walking distance to Old Town Bluffton or The Promenade, so you'll need a car or will have to take Uber to get there (fare is approximately $10 one way). Perks of this Vacation Rental: This recently renovated home has excellent property managers who go above and beyond to provide for their guests. The gourmet kitchen comes very well-stocked (a private chef is also available for hire), each bedroom includes luxury linens, and the bathrooms are stocked with Burts Bees toiletries. The home includes wifi throughout, cable, Apple TV, and Sonos. This home is in a prime location on a corner lot in the heart of the original village and is less than a 5-minute walk to nearly everything — including the Palmetto Bluff spa, restaurant, playground, and chapel. Drawbacks of this Rental: You'll need to pay an additional $65/day fee to access the spa, tennis courts, and a few other facilities. As with any rental in Palmetto Bluff, you won't be within walking distance to Old Town Bluffton or The Promenade. You'll need to take the water shuttle (approx $35), bring a car, or take Uber to get there (approximate $10 one way Uber fare). Check-in time is 4pm and checkout time is 10am, so keep that in mind. 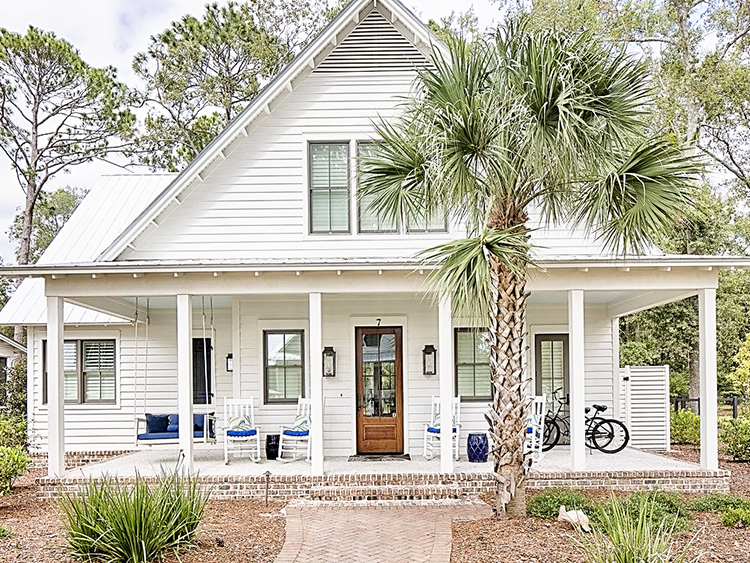 Perks of this Vacation Rental: This adorable cottage home was featured in Coastal Living Magazine, and it's just as picture perfect as you'd imagine! If you're traveling with children (especially girls), they'll love this home. All the best community amenities are within a short 5-minute walk, and there are bikes and golf carts available to rent if you'd rather ride. Garage parking available on site. Drawbacks of this Vacation Rental: You'll need to pay an additional $65/day fee to access the spa, tennis courts, and a few other facilities. This rental is NOT within walking distance to Old Town Bluffton or The Promenade, so you'll need to take the water shuttle (approx $35), bring a car, or take Uber to get there (approximate $10 fare, one way). Prefer a Hotel in Bluffton? No Problem! I hope this guide was helpful! Don't forget to check out my post about Old Town Bluffton to learn more about the area. You can also follow my Pinterest boards if you'd like. 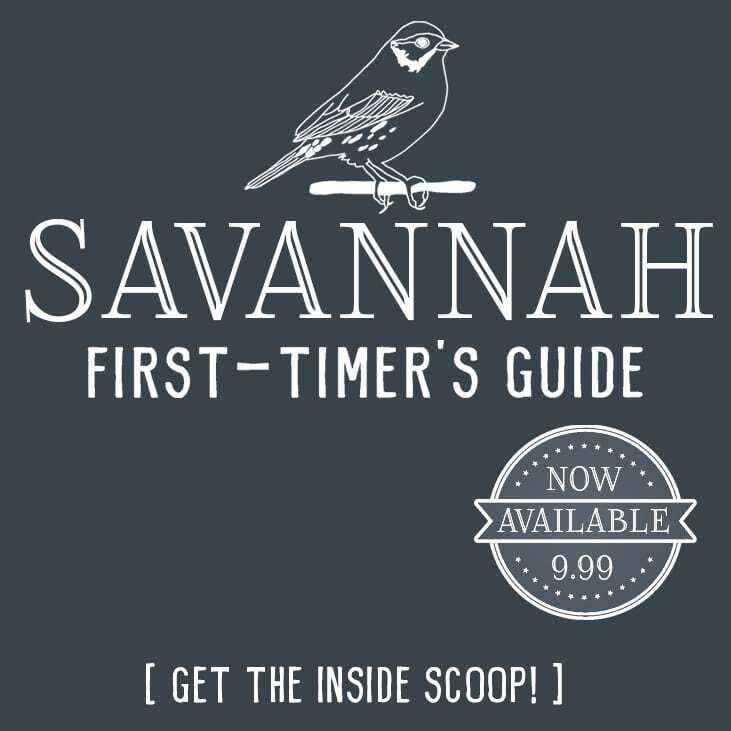 I constantly pin about life in the Lowcountry, since I live nearby in Savannah. 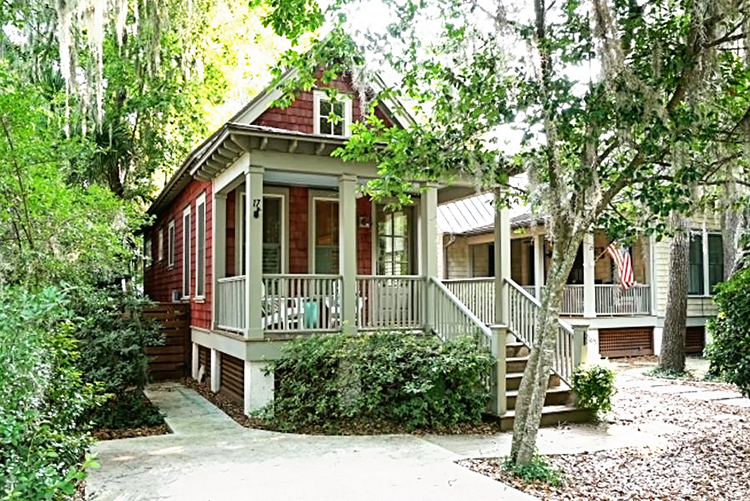 Pin It for Later: These Vacation Rentals in Bluffton, SC, are Calling Your Name! I’m in heaven just looking at these photos! I haven’t been to the South yet but this is exactly what I envisioned! How lovely! Ok, the Carolinas look so beautiful and not sure if its from my obsession with Southern Charm, but I have really been itching to go. These homes are stunning and I so wish we had something like them in the California-its just such a different vibe. Hoping to convince my hubby we need to visit here soon! Oh, I hope you make it someday soon! The HGTV 2018 Smart Home debuts sometime this month (April 17th, I think?) and it’s in Palmetto Bluff, so they’ll have tons of photos and pretty videos on the area. 🙂 You’ll really want to visit after you see that, I bet! It’s such a fun state! It’s small enough that you can see the coast, the midlands, and the mountains all in one day (if you wanted to rush things. lol). The Lowcountry area around Bluffton is my favorite, though.